Air Mail is a delightful flight sim with broad appeal. It's about the precise controls and engaging story, not locking on with missiles or machine guns. A high-flying and highly-enjoyable experience, Air Mail allows you to take to the skies like few others. This is one of my favorite high-flying games on iOS. It looks fantastic, provides solid options for controls and has a cool story that makes each and every task feel important. I would love to have seen some multiplayer and improved cutscenes. That being said, this is a damn good game that I absolutely loved, and highly recommend. An original, fun and entertaining app that is above most of the games in the App Store. 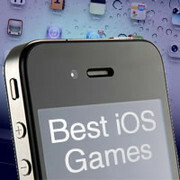 Its gameplay is direct and its control great, and is also beatifully crafted in graphics. An impressive game with a gorgeous world you'll want to explore, Air Mail is only let down by its lack of challenge. The advanced control requires a good bit of practice to get it right, but should eventually be your control of choice. And though a clutch of score-based challenges are both too few and too brisk, they contribute to an iOS game of rare generosity and substance. Whether you're looking for a new fighting game, a platformer, a flying sim, or a more casual action title, there's something for everyone on our list of May's best iOS games.